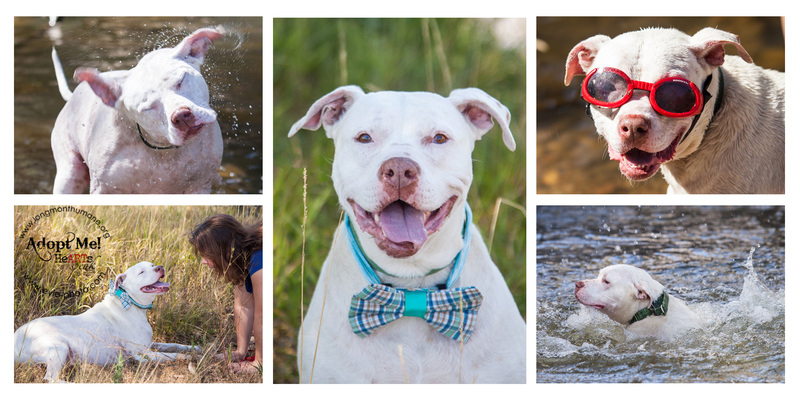 Occasionally we like to get some of the shelter dogs out on a field trip for a special photo shoot. The goal is to show off more of their personalities and to take photos in which the viewer can imagine the dog living a fun life outside of the shelter, hopefully with them. The dogs we choose to take are dogs that have been at the shelter for a long time, usually 3-12 months. Most of our long timers, or patient pooches as we like to call them, have been at the shelter a long time because they may be reactive to other dogs and need to be the only dog in the home. Sometimes they get over looked for no reason at all. So, we (myself, another photographer, and four dog handlers) took 12 dogs from Longmont Humane Society to Golden Ponds for some fun. The dogs had an amazing time eating grass, playing in the water, interacting with people and just relaxing in the sun. Of course the humans had an amazing time too watching the dogs have so much fun. The extra exposure can really help dogs find new homes and it gives them a break from the shelter. I will post more photos of the other dogs soon! This entry was posted in Photographing Shelter Dogs and tagged animal shelter, canine photos, dog, dogs, Hearts Speak, homeless dog, longmont humane society, photographing dogs, photographing shelter dogs, photographing shelter pets, pit bull, shelter dog, shelter pets. Bookmark the permalink. That dog is one cool cat! Hey, great photos!